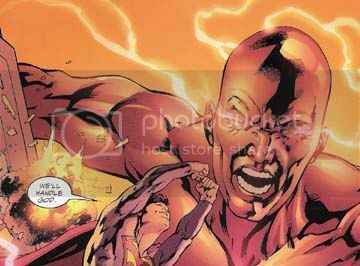 After a massive spaceship spears Earth with a giant spike and carries it away with a host of other inhabited planets, the JLA assists the world-snatchers in their bizarre quest to build themselves an afterlife in JLA: Heaven’s Ladder. Heaven’s Ladder is one of those regrettable instances where the reader’s appreciation is dependent on whether or not h/she’s the type where great art is enough to carry the book (and no, I’m not one of those guys). Bryan Hitch’s art in the OGN is beautiful. With multiple alien landscapes, as well as more familiar Earth settings and vast space shots, Heaven’s Ladder is no small undertaking. From barren desert worlds to spaceship battles, Hitch pulls it off wonderfully and the oversized format makes it that much better, lending more power to the story’s epic nature. His work here is more impressive than his stuff from Ultimates or the regular JLA series, and arguably better than the art of any JLA collections before or since. Waid’s writing, on the other hand, is surprisingly weak and much less impressive than his post-Morrison JLA run or, as far as I can tell, any of his work. The signs of its weaknesses spring up early, particularly in a scene in which his narration describes each League member as h/she reacts to the Earth’s sudden kidnaping. He spouts out lines that make you absolutely groan like "Aquaman drowns in shock," and "Plastic Man lives in his own pliable reality." The science stuff is dealt with much too quickly, and it’s particularly confusing considering the mixture of science and religion. There are so many "Oh, of course!" scientific revelation moments that it feels like a dozen episodes of Star Trek squeezed into one. 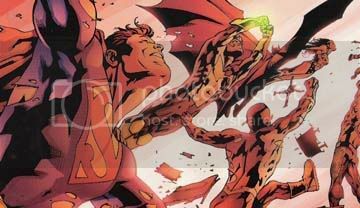 The climactic battle at the end feels a bit too much like end of The Authority’s first arc, and the conclusion is so cheesy that it really doesn’t belong anywhere outside a Superfriends episode. If you’re such a huge Hitch fan that the story’s secondary at best, pick it up. 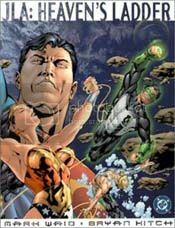 Otherwise, I’d recommend just about any JLA OGN or collection before this one (except maybe Austen’s, which I haven’t read . . . but it’s Austen).